Firefighters have tackled a blaze at a shop near Padstow harbour in Cornwall. 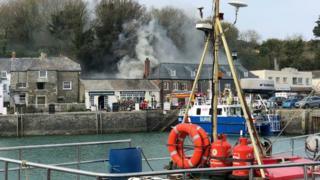 The fire took hold at a property in North Quay in the Cornish fishing town at 14:45 BST. A spokesman for St Austell Brewery said an adjacent pub - The Shipwrights Inn - was damaged. The building was evacuated and no-one was hurt. Cornwall Fire and Rescue Service said crews from seven fire stations attended and crews remained on scene to make sure the fire was out. At the height of the blaze, retail director for the brewery Steve Worrall, said: "Emergency services are currently at the scene and our staff are awaiting permission from the fire service to re-enter the building. "The safety and well-being of our staff and customers is our main priority. "Our thoughts are with our neighbours on North Quay affected by today's incident."